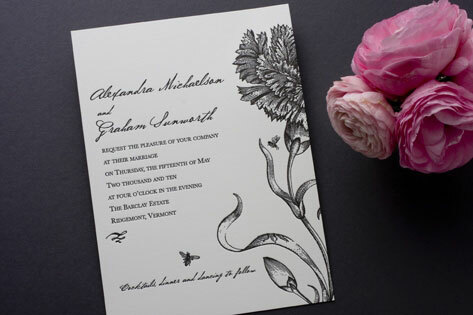 A gorgeous floral illustration, reminiscent of what one might find in an English garden, is the highlight of this bold, single color letterpress wedding invitation. A honeybee adds a warm touch to the design, which is perfect for spring, summer, and garden weddings. Available in black (shown), raspberry, and grass.